Theoretically speaking, popliteus tendinopathy, also known as popliteus tendon tenosynovitis is a gap in the tendon of the popliteus. Popliteus is quite an uncommon pathology which often occurs in athletes and people with a history of other knee ligament injuries after trauma. It is a relatively unusual condition in non-athletes without a history of Knee traumas. The popliteus muscle is a small muscle on the posterolateral corner of the knee. It has 3 origins: the lateral femoral condyle, the fibular head, and the lateral meniscus. The proximal insertion of the popliteus muscle is on the proximal side of the tibia, proximal of the linea muscli solei. The insertion on the lateral meniscus is absent in 82,5% of cases. The tendon is intracapsular, runs deep into the collateral ligament, and passes through the popliteal hiatus in the coronary ligament to attach itself to the lateral femoral condyl. The tendon is intracapsular, but extra-articular and extrasynovial. The primary function of the popliteus muscle is the internal rotation, also called endo-rotation of the lower leg, during walking. Its most important role is providing forward stabilisation of the knee, and also the stabilisation of the retraction of the backside of the knee joint and the lateral meniscus during the flexion of the knee. It allows the knee to flex when it is in full extension. Due to its unlocking function, the popliteus muscle is often seen as the key to unlock the knee. Popliteus tendinopathy may be caused by overuse of the popliteus muscle-tendon unit. It usually occurs in athletes who run or train on hills or banked surfaces. Common causes are either a direct varus force, while the tibia is externally rotated, or a sudden forced knee hyperextension with the tibia internally rotated It may also be associated with hyperpronation of the foot because this causes an external rotation of the tibia. 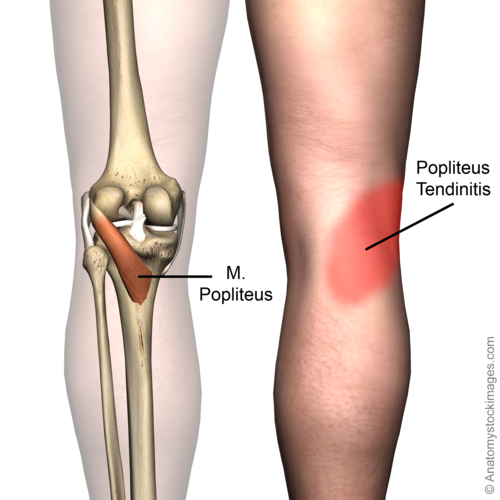 You can recognize a popliteus tendinopathy to the acute pain that occurs at the posterolateral part of the knee joint. This can be accompanied by an inflammation, acute onset of pain, localised swelling, redness and marked tenderness over the lateral side of the knee, at the insertion of the popliteus tendon. Also, the area around the popliteus tendon (from the fossa popliteal to the outside of the knee joint) will be very sensitive and painful. A crackling sound (crepitation) when the tendon is moved is also generally heard. Because of the muscle spasm, there will be a painful resisted knee flexion (15-30°) or internal rotation and the knee cannot be fully extended. If the patient continues to load his knee, symptoms will get worse and scar tissue can form, which can make physical activity even more painful. Physical activities like walking, running and going up stairs, can be hindered especially shortly after the injury is sustained. Downhill running or walking will therefore cause increased stress on the popliteus muscle-tendon unit in an effort to decelerate the body weight, with tenosynovitis and exacerbated symptoms as a result. Popliteus tendinopathy is often diagnosed in professional runners and triathletes. It is highly unusual for this injury to present itself in a non-athletic person without a history of knee trauma. The diagnosis should largely be established following a careful analysis of the case history and a thorough physical examination. Usually patients have symptoms that include tenderness along the course of the proximal popliteus tendon and pain with resisted external rotation. The differential diagnosis of reported posterior knee pain should always include an intra-articular pathology, such as a posterior horn tear of the meniscus. Osteochondritis dissecans which is an intra-articular osteochondrosis with an unknown etiology that is characterized by degeneration and re-calcification of articular cartilage and underlying bone. Iliotibial band Syndrome: which is an overuse condition. Tenderness is palpable at the lateral side of the knee joint. The pain becomes worse during activity, particularly running downhill and climbing stairs. The popliteal cyst can also be confused with a popliteus tendinopathy. A popliteal cyst, also called a Baker's cyst, is the most common synovial cyst of the knee. It originates from the posteromedial aspect of the knee joint at the level of the gastrocnemio-semimembranous bursa. The patient reports insidious onset of mild to moderate pain in the popliteal area of the knee. Recognising and correctly diagnosing popliteus tendinopathy is very important. Tendinopathy of the popliteus muscle can be very painful and limit the athletic performance. A misdiagnosis can lead to unnecessary surgery. Popliteus tendinopathy is an infrequent and often misdiagnosed injury of the posterior part of the knee. A popliteus tendinopathy diagnosis should be based on the case history and a physical examination. MRI scan or other radiography can be used to diagnose tedinopathy. In a case study we found finding of unusual amount of fluid related to the popliteus sheath but the tendon seemed to be intact with no soft tissue injury. For objectively determine the baseline function of the patient at the beginning of the treatment and to determine progress and efficacy of treatment efficacy we evaluate the patient by testing his mobility and his force. In the beginning the the patient experiences acute pain during testing. As a result, most movements in the knee are limited especially the flexion of the articulation. The patient is unable to do weight-bearing exercises on his affected side. There is also pain during resisted external rotation. The progress of the patient and the effectiveness of the therapy can be measured by using the patient specific scale or the lysholm score before, during and after the treatment. It is important that popliteal tendinopathy is correctly diagnosed. If misdiagnosed it can limit athletes’ performances and lead to surgery. The diagnosis is established by assessing carefully the case history and by a physical examination. Physical examination: the patient sits in ‘ a figure 4’ position with the affected leg in a crossed-legged position, the hip flexed, abducted and externally rotated and the knee flexed with the leg crossed over the opposite extremity. The therapist palpates the posterior lateral corner looking for tenderness. To test the popliteus, the patient can be placed on his back on the table with the knee in a 90 degree flexion and the foot in dorsiflexion. To test the popliteus, the therapist then has to going push the foot and underleg externally while the patient has to maintain his position. The treatment for popliteus tendinopathy includes rest, ice application, elevation, an elastic wrap, physical therapy, and nonsteroidal anti-inflammatory medication for pain, such as aspirin or ibuprofen. Additional treatment for popliteus tendinopathy may include oral corticosteroids or corticosteroid injections. Many individuals find a compression bandage or a knee sleeve very useful to reduce symptoms. Alternatively, in order to reduce the pain, the physician may also recommend taping the area of the injury. But when it comes to severe tendinopathy (symptoms persist for more than 6 months), surgery has to be performed to remove the tendon sheath. SB Tibrewal in an article entitled Acute calcific tendinitis of the popliteus tendon – an unusual site and clinical syndrome, described that the patients were treated with Neoprin knee splints, anti-inflammatory medication (Diclofenac 50 mg tds) for 2 weeks and physiotherapy on an out-patient basis. All patients responded to an injection of corticosteroids and local anaesthetic with immediate pain relief. The key to physical therapy should be to train patients to perform tasks using a technique that is natural for them. One should avoid tissue stresses associated with moving too far into a genu varus or valgus posture, or fast tissue stresses with patients with poor dynamic lower extremity postural stability. The treatment of tendinopathy is most of the time conventional. The purpose of the treatment is to reduce pain, as well as improving the functionality of the knee. The standard therapy consists of rest (RICE), NSAIDs and muscle strengthening exercises (eccentric training). RICE: to prevent further damage and to reduce pain and swelling, which may also in turn help to start the healing process. Full immobilisation must be avoided in order to prevent muscle atrophy; therefore light loads should be used to guide the normal alignment of the collagen tissue. NSAID: may be given to the patient to reduce pain and may offer additional benefits in acute inflammatory tendinopathy because of its anti-inflammatory properties. For the popliteus, eccentric strengthening (closed kinetic chain) of the quadriceps is effective to reduce strain on the popliteus. Patients should not run until the knee is free of pain, then they should limit their workouts and downhill running for at least 6 weeks. During the treatment cycling provides a good alternative exercise. Ultrasonography, shock wave therapy, orthotics, massage, and technique modification are treatment options, but few data exist to support their use at this time. Using ultrasound and performing transverse friction massage can be part of the therapy as well, as it will improve the healing process. Surgery is an effective treatment that should be reserved for patients for which conventional therapy has failed. It is also necessary to wear correct shoe wear that fixes the hyperpronation and prevents popliteus tendinopathy. Attach a resistance band on to the forefoot of the non–weight-bearing leg (NWBL). The foot on the NWBL moves behind the stance leg via external rotation of the hip and knee flexion. The foot of the NWBL continues to move behind the stance leg with increasing internal tibial rotation. Completion of the concentric exercise. The return to start position provides an eccentric muscle effort. In this exercise, the patient has to do a quick loading-unloading step exercise. This means that the exercise will be done as fast as possible, without losing the integrity of the exercise. A stepping task performed on an unstable surface. The patient isometrically tenses the popliteus muscle. The examiner stretches the popliteus muscle by abducting the forefoot. ↑ 16.0 16.1 Walter L. Calmbach , M.D, Mark Hutchens; Evaluation of Patients Presenting with Knee Pain: Part II. Differential Diagnosis, American family physician volume 68 , p 917-922. ↑ Chung B, Wiley JP. Extracorporeal shockwave therapy: a review. Sports Med. 2002;32:851–65.